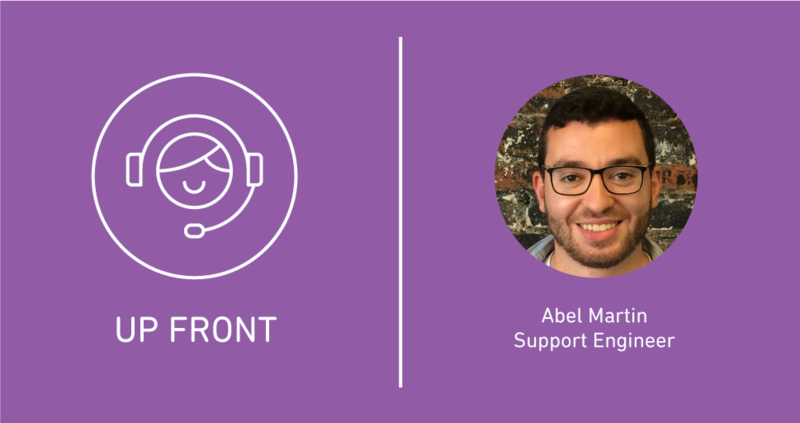 Abel is a champion for our Zendesk Voice product, and given that he hails from Spain, he jokes that with his accent it sounds a little like he’s a “boice champion”—say that out loud and you’ll see why he’s gotten a few strange reactions in meetings. Prior to Zendesk, Abel worked for a few years in a support role at Blizzard Entertainment, and before that in retail. Here I attempt to glean some of his professorial wisdom about providing Tier 3 support. Personal mantra: I would say that my mantra is help everyone that I can, as much as I can. Spirit animal? Dogs. All of them! Best pub in Dublin? The Barge. That’s where the magic happens after work. Why Support Engineering? What do you love about it? What I like about support engineering is that I can help customers, work on projects with engineering, and focus on really difficult questions. In other tiers of support maybe you have to focus on helping more customers in less time, but in support engineering you basically have to do as much as you can, going above and beyond to help. There’s nowhere else to go after support engineering, so you’re the last person the customer is going to talk to. Just as an example, when I was working at Blizzard I was doing 100+ tickets a day. There I was just sending one reply per customer. Now I do fewer tickets, but I spend far more time on them, time which has to be well-spent. Sometimes that means solving technical problems that aren’t always Zendesk-related, just to help give the customer the best experience. I also like to develop and studied a bit in Spain, so I think combining customer support with development allows me to show and actually do my best. You were described as partnering well with other teams. How can support build great internal partnerships, and what can other departments do to better support their support team? My best advice is to be open to anyone who’s asking you for help and be honest about whether or not you can help them making sure that even if you don’t provide the answer they are looking for, they will know where to get it. I’ve worked in some companies where, if you need outside help, you have to ask your manager, and your manager will have to ask someone else, and that someone will have to talk to another person. But right now, if I need help from a developer, I just go and ask him directly. That makes my job easier and the customer support experience I provide better. Communication is the best thing. But I also have this poking stick I got on Amazon. Whenever I have an issue, I just bring it upstairs and the developers go, “Oh, what broke?” I go to the guy I need and poke him, and they all laugh, and we work together. You just have to treat your colleague as another customer. Treat everyone equal, and help them. Sometimes other teams will ask me to train customers and prospects, or they’ll come to me because they have questions about the product. I appreciate that they want my opinion and help. I think it’s good not to think about what department another person is in. They’re just another person, and if you expect other people to help you, then you’ll do the same. Zendesk advocates are front and center with our customers and our product. This is the first post in a new series highlighting the people behind the tickets and learning from their experience about what makes great customer service.